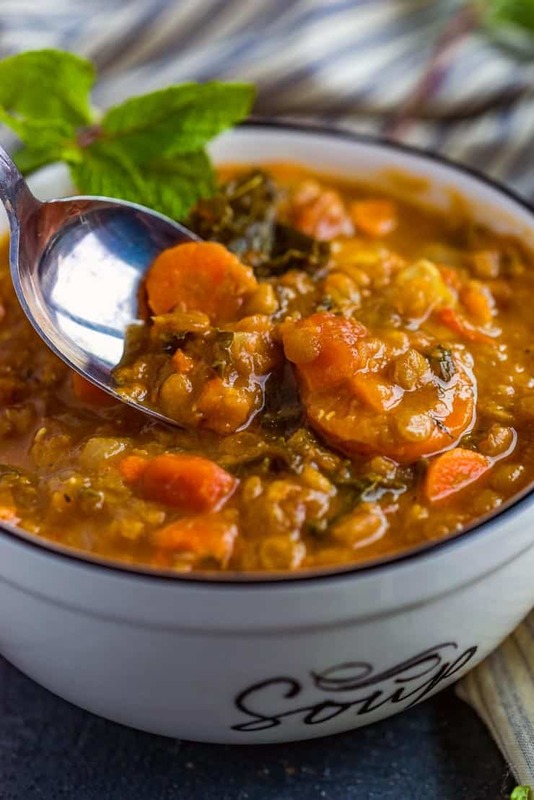 Instant Pot Lentil Soup-- the Best You'll Ever Have! 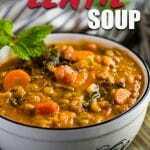 Instant Pot Lentil Soup cooked in the Instant Pot is a quick and easy soup that is filled to the brim with flavor. 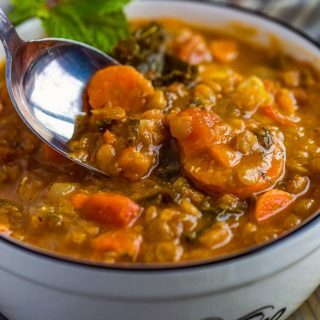 Instant Pot Lentil Soup is basically what my fall dreams are made of. It’s rich and hearty without being heavy like many hearty soups are. 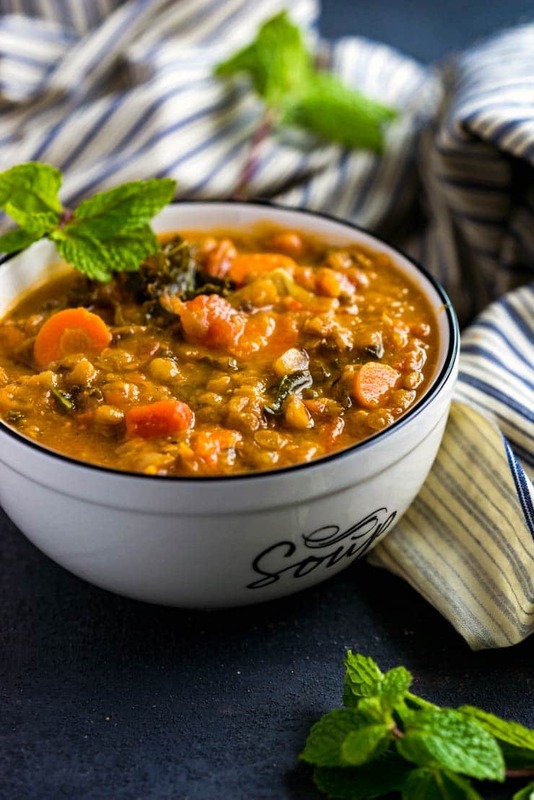 If you’ve been turned off by lentil soup before because of its lack of flavor or texture you’re going to want to give this recipe a try– I really don’t think you’ll be disappointed! 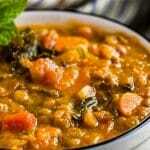 Everyone I’ve made this Instant Pot Lentil Soup for has raved about it and asked for the recipe. If you don’t have an Instant Pot, no problem! In order to cook this soup on the stovetop, follow the recipe directions through step #2. 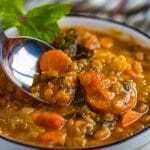 Bring your soup to a simmer on the stovetop and cook for about 30-35 minutes or until the lentils are tender. Continue with the directions as printed on the recipe. This recipe is a fantastic vegetarian/vegan soup as is, but I’m of the camp that believes everything is better with just a little bit of bacon. Adding a couple of slices of chopped bacon to the pan in step #1 adds a nice smokiness to the soup that I love. Soup is always better with a good hunk of bread to dip in it and this N0-Knead Bread goes perfectly with this Lentil Soup. Don’t skip the lemon juice or use concentrated lemon juice! The FRESH lemon juice really makes all the flavors in the soup POP and turns it into something magical. Concentrated lemon juice (the kind in the bottle) does not have the same flavor as fresh and might make your soup taste a little off. Use fresh lemons and you’ll be glad you did! 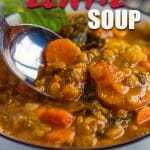 Want More Instant Pot Soup Recipes? An Instant Pot: This is the model that I have and LOVE. My pot been with me for over a year, but still works like new! It’s changed the dinnertime routine at our house and helps me make meals in under an hour that used to take HOURS! OXO Handheld Slicer: I love this little tool when making soup because it slices small amounts of veggies quickly and easily and I don’t have to dirty a cutting board– I just slice right over the pot! I especially love it for carrots and celery. Better Than Boullion: I use a lot of chicken/beef/vegetable broth in my recipes because it adds such nice flavor but I don’t love keeping cans or cartons of it in my pantry. For this reason (and more) I use this broth base anytime I call for broth in my recipes. It only takes 1 teaspoon of base to make 1 cup of flavorful broth and can be stored for quite a while in the refrigerator. Preheat Instant Pot on the "Saute" setting until hot and pour in olive oil. Cook onion, carrots and garlic in the oil until fragrant and stir in the cumin, curry powder and thyme. Cook for 1 minute, stirring constantly. Allow to Instant Pot to release pressure naturally or wait 5 minutes and manually release the pressure if you're in a pinch for time. Remove about 2 cups of the soup, place into a blender, and blend until smooth. Stir pureed soup back into the rest of the soup. Alternately you can use an immersion or stick blender to lightly blend the soup and thicken it up a bit. Adjust salt and pepper seasoning to your preference and stir in lemon juice-- this really makes the flavors pop! Stir in chopped kale and set Instant Pot on saute mode to bring the soup to a simmer and cook for an additional 5 minutes or until the kale is tender. This soup was GREAT, and I’m not a big lentil fan. I subbed 2 cans of tomato sauce for the canned tomatoes, then added 2fresh tomatoes, because that’s what I had. Also used smoked paprika instead of chili peppers. Love the soup!! Added a 1/2 tablespoon of maple syrup. The soup was tasty but too salty for me – was up all night needing to drink water! That teaspoon of salt could have been a half teaspoon in my opinion, if that. Phenomenal! I added ham. Other than that, I wouldn’t change a thing! Thanks!